These Pisces always doubt everything: they do not believe in facts, but only in their own sensations. Nature has endowed them with the ability to anticipate future events, which only complicates the lives of these hypochondriacs. Trusting Dog completely falls under the influence of Pisces: it becomes even more restless, and sometimes aggressive. The union of these two signs gives rise to a surprisingly sensitive, delicate and vulnerable person. According to the combined horoscope Pisces-Dogs are responsible, compassionate people, ready to help everyone around. Wise, shrewd, able to give the right advice, and most importantly: do not bother with their obligations. They can not refuse any help, but they are not less persistent in defending their own interests. Soft, gullible Pisces-Dogs give the impression of innocuous people. Although they can stand up for themselves: they have a special inner power. Do not resort to rudeness, do not weave intrigues, but simply try to convey your idea. The main feature of the Pisces-Dog sign is outstanding diplomacy. The man of this combination easily reconciles the warring sides. It does not just lead convincing arguments, but does it in a very tactful manner. Thanks to his intuitive instinct, the Pisces Dog perfectly understands the feelings of others. He is able to find an approach to each of his many acquaintances. People are attracted to this sensitive person, you can rely on him: attentive and caring towards others. Tactful, polite Pisces-Dogs are the favorites of society: people like their courteous manners. Respect the opinion of others, they often sacrifice themselves for their well-being. Do not require anything in return, but simply rejoice in someone else’s happiness. Disinterested, honest Pisces-Dogs deserve respect, which often happens. Although there are dishonest people who try to assert themselves at their expense. However, kind-hearted Pisces Dogs are not so simple and naive, if it is a matter of principle for them questions. They are quite capable of rebuffing, although they will feel embarrassment and awkwardness because of the need to raise their voice. They appreciate not only their freedom, but also respect the feelings and opinions of others. Radiant, good-natured Pisces-Dogs try not to deliver unnecessary problems to others. They hide their experiences, but from this their life does not get better. Are inclined to doubts: they delve into all details, pay attention to minor trifles. Dogs-Pisces are not confident and shy. They will remain silent or pretend that everything is in order, but they do not admit their weaknesses. Only really close people can be opened, who are not so many in their environment. They are waiting for participation and understanding, but more often than not they are themselves in the role of comforter. Responsive and kind-hearted: they can not refuse help, despite their own problems. Usually Dog-Pisces are in the shadow of more self-confident people, that they do not bother at all. 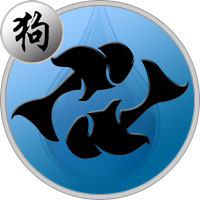 Delicate, sensitive to the needs of people Pisces-Dogs are ready to dissolve in their partner. They are looking for a soul mate, they are afraid of making mistakes, that’s why they are very cautious in acquaintances. They look long at the future companion of life, they try to understand how reliable it is. Shy Pisces-Dogs are not in a hurry with confessions of love: they find it difficult to make the first step. But once determined on the choice, they will serve their half faithfully for life. These people are attuned to a serious relationship — they are hard at the break. The love horoscope gives a clear definition of Pisces-Dogs — the ideal family man. These people are simply created for marriage: they do not tolerate loneliness at all. Nature has endowed them with amazing sensitivity and kindness. Dogs-Pisces have a pedagogical talent: they do not just feel, but even anticipate the desires of children. There is harmony and peace in their family, because they avoid conflict in every possible way. They can not tolerate discord among close people: they sacrifice themselves for the sake of preserving common peace and tranquility. Responsible, disciplined Pisces-Dogs are able to cope with any work. Do not dream of a good career, even a little shy of high posts and prestigious titles. At work are held modestly, do not be afraid to be in the shadow of more brisk employees. They are susceptible, subject to doubts and feelings, so they often refuse beneficial offers. Dogs-Pisces are diplomatic, patient and attentive to their colleagues. In turn, they need support, otherwise it will be difficult for them to succeed in the profession. These creatively gifted, intellectually developed personalities are the pride of any collective. Pisces-Dogs are excellent at organizing work, but do not tag on leadership positions. Are able to take place in any field of activity: pedagogy, psychology, medicine, construction. What is surprising: despite the shyness and isolation, Pisces-Dogs often choose creative professions. They feel the need to share their experiences with people, and they are good at it. Responsive Pisces-Dog man is always ready to help, not only friends, but even ill-wishers. He tries to understand the motives of the offenders, does not feel anger and hatred towards them, very quickly forgives. A thin person has a huge heart, is full of compassion for everyone around him. His gentleness, indecision are obstacles on the way to a successful career. With all his talents, he is too cautious, he prefers to think a lot and not act actively. But hardworking and very responsible, so the bosses are always in good standing. Fears and doubts cause trouble in their personal lives, painfully perceives any comments. Women should be sensitive and especially attentive to the man of this zodiac combination. A shy, gullible Pisces-Dog woman can be strong and determined if necessary. But basically it behaves quietly and imperceptibly. Carefully avoids attention, but if it so happened that her profession is connected with publicity, is very dignified. She knows about her weaknesses, so she prefers to think through all the actions in advance, to calculate the risks in order to feel calm. Sometimes her thoughtfulness interferes with the implementation of plans. The woman of this sign combination lacks energy, can achieve success in alliance with a strong partner. She is very devoted to her family, but she reacts impetuously to criticism, she can only be offended by a couple of careless words. But thanks to natural prudence finds the strength to preserve peace and tranquility in the family.